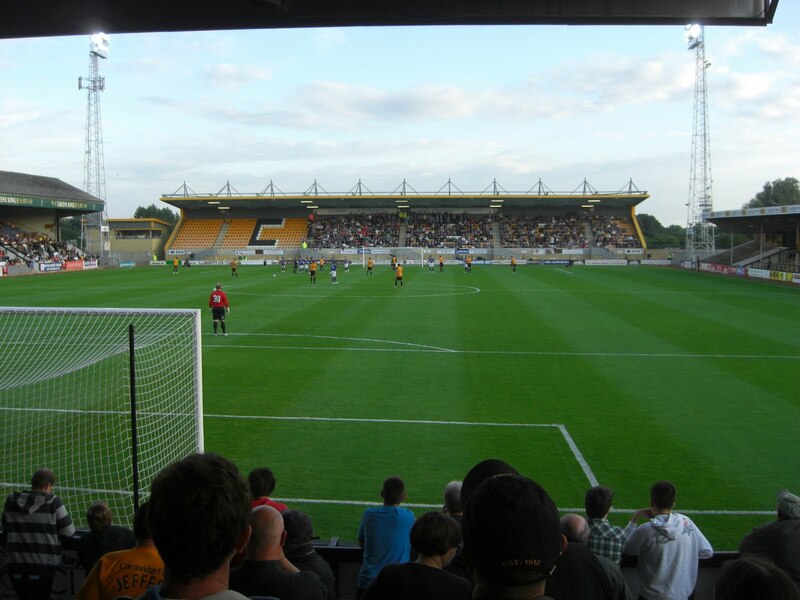 My thirty-ninth stadium of 2011 was on Tuesday 19th July 2011 at the Abbey Stadium in Cambridge, Cambridgeshire. The match was Cambridge United vs. Ipswich Town in a friendly game. The Abbey Stadium (also known as the R Costings Abbey Stadium) is a two-mile walk from Cambridge railway station. The ground has been home to Cambridge United since 1932 with the venue having hosted league football from 1970 until 2005 when the club were relegated to Conference National. The ground has two all-seater stands and two all-standing terraces. The Habbin Stand on the west of the ground is the largest terraced area and is split down the middle with a north and south section. The north section was the only half that was open to spectators for this game. The North Terrace is the smallest stand in the ground. Behind the goal at the north end it stretches about two-thirds of the way across the pitch with an open area to the right of it in the corner of the ground. The terrace retains the atmosphere well and this is where I watched the game from. The Main Stand is an all-seater stand on the east side of the ground which runs the length of the pitch and contains the bulk of the stadium's 4,900 seats. The other all-seater area is the South Stand which is the newest stand in the venue, having been built in 2002. It is capable of holding around 1,600 people and is where away fans are placed. The game was a pre-season friendly between Conference National side Cambridge United and Championship side Ipswich Town. There was an explosive start to proceedings as Cambridge raced away from the Ipswich defence to take the lead after 64 seconds. Just a minute after this a superb dipping free-kick put the hosts 2-0 up against their higher division opposition. Ipswich quickly came back into the game and within 20 minutes have levelled the scores at 2-2. Both teams battled from then on and had numerous chances to score, the closest of which when Cambridge hit the bar in injury time. However, no more goals were forthcoming which meant the thoroughly entertaining tie finished all-square at 2-2. I’m in the process of writing a book about ex-Football League teams and wondered if you could give me permission to use some of your photos of the Abbey Stadium. I will give you credit for any photos that I use in the book. Hi Latics, yeah that's fine, I've got no problem with you using some of the photos for your book.